Video agency Zut has added three new staff to its Liverpool-based team. Andy Horan has been appointed as lead animator following a surge in demand for design animation. 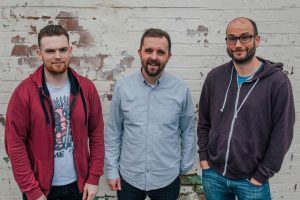 Having previously worked at Mighty Giant in Manchester before establishing a successful career as a freelance motion designer, Horan brings more than 10 years' experience to the team. Producer Tom Guerrier joins Zut from Bite Communications in London, where he worked with a raft of high-profile brands including Amazon, Hasbro, The Trainline and Williams Martini Racing. Guerrier has previously worked with Comedy Central, Coca Cola and The National Trust as well as the BBC and ITV, and has worked on more than 40 episodes of Come Dine with Me. And Michael Kenny, a TV and film production graduate, joins the team as a production assistant. “While we are well known for high quality video production and developing content strategy, we are increasingly working with clients on other areas such as animation and live web broadcasting. Launching in 2008, Zut works with clients including Betfred, Everton, Umbro, The Hut Group, Carillion, Brabners, Russell Hobbs and the NHS.